will link the British and French electric power grids to make energy markets more efficient, improve security of supply and reduce carbon emissions. To take part in the consultation, please call our Freephone information line on 01962 893 869, or send an email to aquindconsultation@becg.com. You can visit our consultation website by clicking on the link below. AQUIND Interconnector is a new subsea and underground High Voltage Direct Current (HVDC) electric power transmission link between the South Coast of England and Normandy in France. By linking the British and French electric power grids it will make energy markets more efficient, improve security of supply and enable greater flexibility as power grids evolve to adapt to different sources of renewable energy and changes in demand trends such as the development of electric vehicle. The European Commission has designated AQUIND Interconnector as Project of Common Interest (PCI). With the capacity of 2,000 MW, AQUIND Interconnector will transmit 16,000,000 MWh of electricity each year between the two connected countries, which is 5% and 3% of the total consumption of Great Britain and France respectively, i.e. consumption by millions of households. The technology used for the interconnection will allow transmission of electricity in both directions. This will result in more efficient use of production capacities and better management of electricity consumption and production fluctuations. The interconnector will also be able to provide various services to the national system operators in both countries to help ensure safe and reliable operation of national electricity transmission systems. The project may also include fibre-optic data transmission cables laid together with the electric cables. AQUIND Interconnector will use well-tested and reliable technology. Without overhead lines, AQUIND strives to achieve as low visual impact as practically possible. AQUIND Interconnector is being developed without government subsidies. This will ensure additional security and diversity of energy supply, promote energy market competition and enhance value for energy consumers. The actual utilisation rate of the interconnector depends on market conditions, limitations by national transmission system operators and other factors. The distance between the connecting stations at Lovedean in Hampshire and Barnabos in Normandy renders the use of a simple Alternating Current (AC) connection impossible. Furthermore, it is essential that disturbances in one network do not affect the consumer power supply in the other network. For these reasons, the interconnector will utilise the High Voltage Direct Current (HVDC) technology. It provides the most controllable and efficient power connection between the networks while effectively de-coupling the networks in terms of disturbances that could affect consumers on each network. 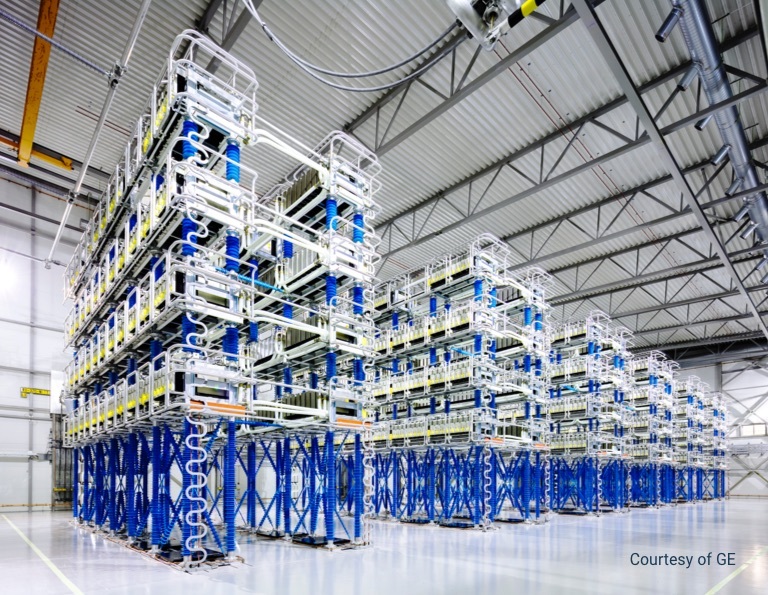 The HVDC technology had been widely used for high power interconnectors since the 1960’s but in the early 2000’s a new generation Voltage Source Converter (VSC) based HVDC technology entered the market. It uses state-of-the-art power electronic converters and digital control systems to create compact stations that convert AC power to DC power. The AQUIND converter stations will leave no more than half of the footprint left by an equivalent conventional LCC converter station. 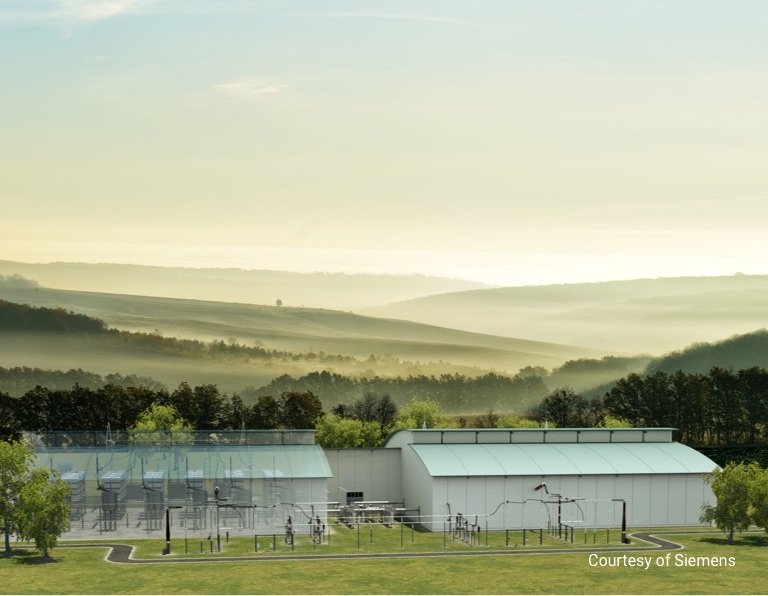 Applying the new VSC technology will further enable AQUIND to offer ancillary services to the transmission networks by providing rapid voltage and frequency support during system disturbances. At the heart of the Lovedean and Barnabos converter stations will be the latest generation of power electronic converters. The converter features hundreds of sub-modules complete with redundant units. This maintains the station in service at full power even with multiple sub-modules out of service. A key design requirement for AQUIND Interconnector is a considerably high level of energy availability coupled with minimal maintenance requirements. To ensure that no single fault results in a complete loss of the interconnector, AQUIND will be designed as two independent 1,000 MW links. Each link will be fully self-sufficient in terms of control systems, protection systems, auxiliary power supplies and cooling systems. Very few credible faults can result in a complete loss of a 2,000 MW power capability. As part of the AQUIND Interconnector project, AQUIND will be deploying fibre optic infrastructure for protection and monitoring purposes. 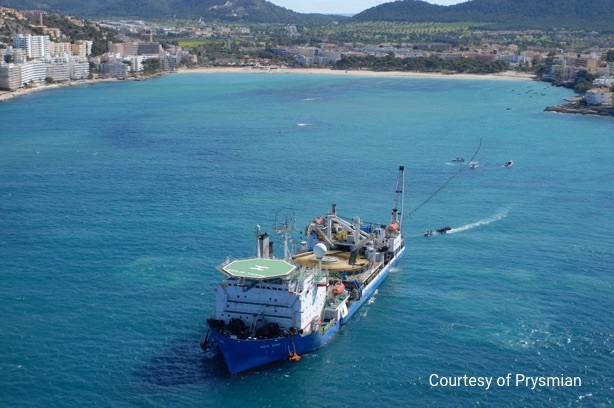 A fibre optic data transmission cable will be installed in a trench alongside and at the same time with each of the two power cable pairs both offshore and onshore. The spare data transmission capacity of such cables may be used to transfer data of third parties, providing further connectivity between France and England. Demand for data transmission and, therefore, high-bandwidth, fast and reliable data transmission capacity is growing rapidly as services, technology and data uses continue to evolve. Meeting that demand is becoming increasingly important for economies and quality of life. Using the latest subsea and optical technology, AQUIND will deliver high speed connectivity between England and France. Up to 180 “dark” fibres in each of the two data transmission cables may be available for third-party access enabling the high data transfer rates of up to 100 Gbps per fibre pair. The AQUIND fibre optic transmission link offers a shorter route than some of the existing systems, ensuring the low latency time of approximately 2.622 ms. The system will be capable of connecting the French and English shores without the need for amplification by subsea repeaters. 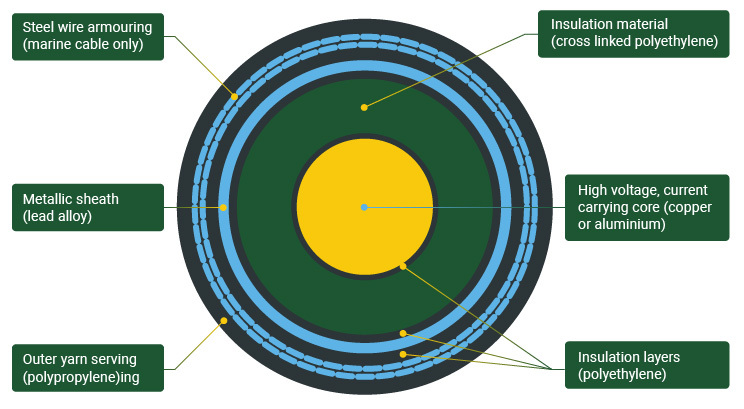 Installation in the same trench as the power cables and alongside them, together with separation of the two cable systems, ensure consistent protection against fishing and anchor damage as well as natural hazards. 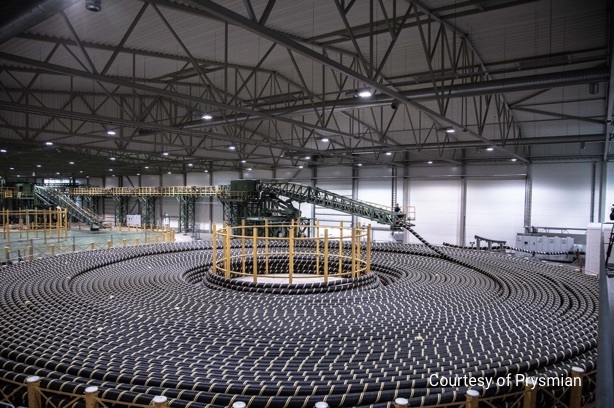 From each converter station two pairs of HVDC cables, one positive and one negative, will connect to a remote station. 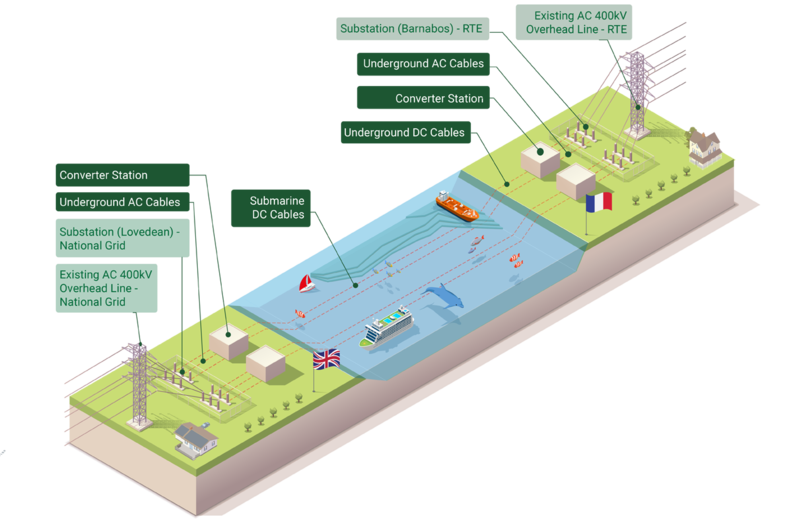 The cables will run underground from the converter stations to the coastline and underwater across the English Channel. 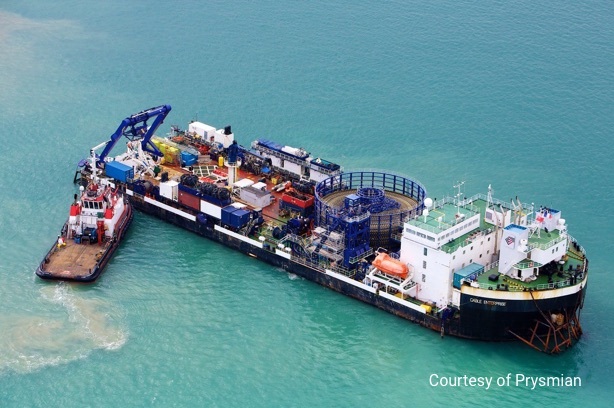 The cables will be buried below the seabed to protect them from shipping damage. The cables consist of a central aluminium (or copper) core surrounded by plastic extruded insulation known as Cross-linked Polyethylene (XLPE), which allows the cable to operate at ±320kV. No oil-based insulation is used in the design of these cables meaning no leakage in the event of damage to the cables. The submarine sections of the cables have additional armouring to provide mechanical protection as they are delivered off the back of a cable-laying vessel directly onto the seabed. Alexander is a prominent British industrialist, a vocal meritocracy advocate and a believer in Great Britain as a high-tech hub for industries of the future. An engineer and a lawyer by training, Alexander was a junior minister and a key negotiator in the Boris Yeltsyn government before turning his attention to industry and manufacturing. In 2000, Alexander joined Yukos Oil Company where he served as director and deputy chairman of the board before moving to the UK in 2005. Between 2008 and 2017, Alexander was director and deputy chairman of Newcastle-based OGN Group, an engineering, procurement and construction services provider to the North Sea offshore energy industry. Alexander regularly contributes to major UK and international media on economic and political affairs. A non-executive director with AQUIND Limited and a former Partner at KPMG Russia and CIS. Richard is a Fellow of the Institute of Chartered Accountants in England and Wales and where he began his career with Arthur Andersen & Co in London qualifying in 1983. He worked for several UK listed companies before joining KPMG where he advised on the Middle East, Russia and Central & Eastern Europe. Following his 17 years with KPMG, Richard has served as an independent and non-executive director for a number of companies, including the OGN Group and from 2008 to 2014 on the Supervisory Board of Credit Bank of Moscow where he was also Chairman of the Audit and Risk Committee. Kirill has been leading the AQUIND Interconnector project since its inception in 2014. Formerly a senior lawyer with major Russian energy companies and industrial heavyweights, he holds an MBA from the London Business School. Kirill has advised UK companies, including OGN Group, on corporate and business development and joined the board of Aquind Limited, the OGN Group renewables arm, in 2011. Following a corporate spin off, Kirill became Managing Director of the newly independent AQUIND Interconnector business in 2016.